After Christmas I decided to give the Steamed and Roasted Turkey a try myself. 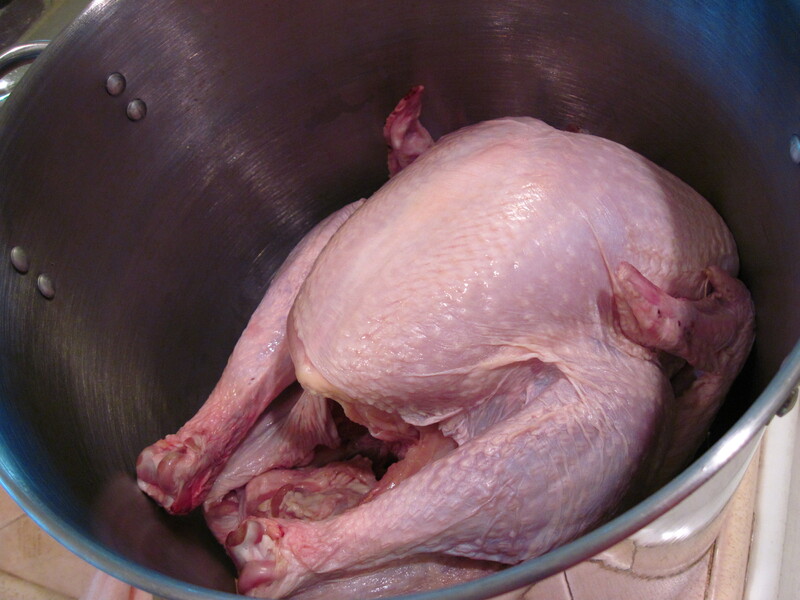 I had inherited a huge pot from my mom and it easily held my 12-pound turkey. We had Jacques’ sauce on Thanksgiving, along with traditional gravy. The sauce was really good, but I decided to use the broth to make the gravy I usually make for my post-holiday turkey dinner. If you have a pot that’s large enough, I definitely recommend this method. 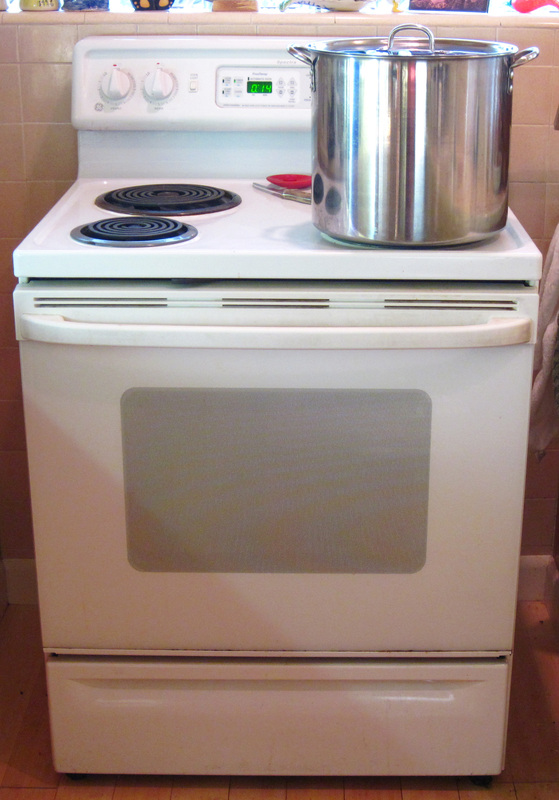 If you don’t have a large pot, my Holiday Roast Turkey is easy and I’ve always had good results with it. 2. 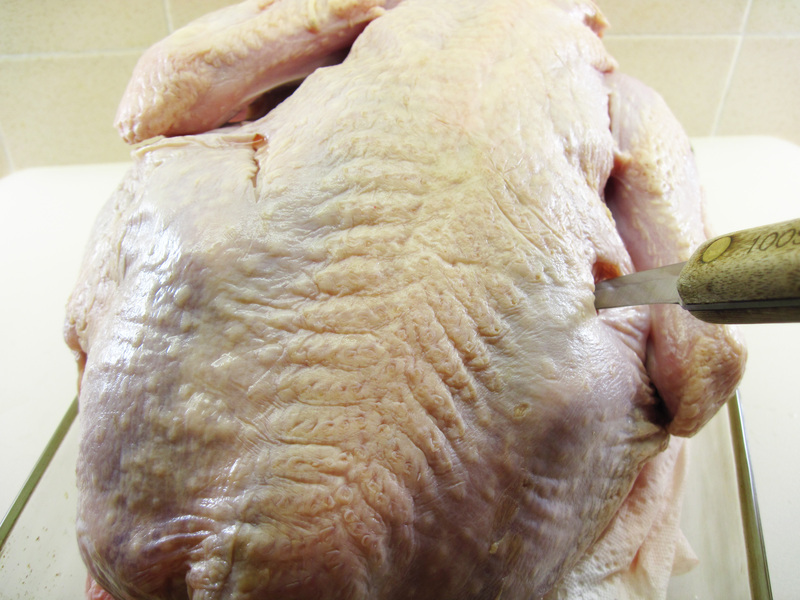 Make a cut about 1 ½ inches long and about 1-inch deep where the thighs connect to the body and where the wings connect to the breast. 3. Put a small rack in the pot. If you don’t have one, you can improvise. I used 3 balls of heavy-duty foil and put a wire rack on top of that to raise the turkey off bottom of the pot. 4. Put the turkey in the pot and add 6 cups of water. Bring to a boil. Cover, reduce the heat so it is simmering, and steam for about 30 minutes. This photo gives you an idea of how large my pot is! 5. Combine the apple cider, cider vinegar, Tabasco, and salt in a small bowl for the glaze. 6. After the turkey has steamed for 30 minutes, remove the pot from the heat and let it cool a bit so the turkey is easier to handle. 7. Preheat the oven to 375˚. When the oven is hot, put the turkey breast-side up on a rack in a roasting pan. (Reserve the broth that is in the pot.) Add 3 cups of water to the roasting pan and scatter the onion pieces and carrots in the water around the turkey. 8. Roast the turkey for 30 minutes. 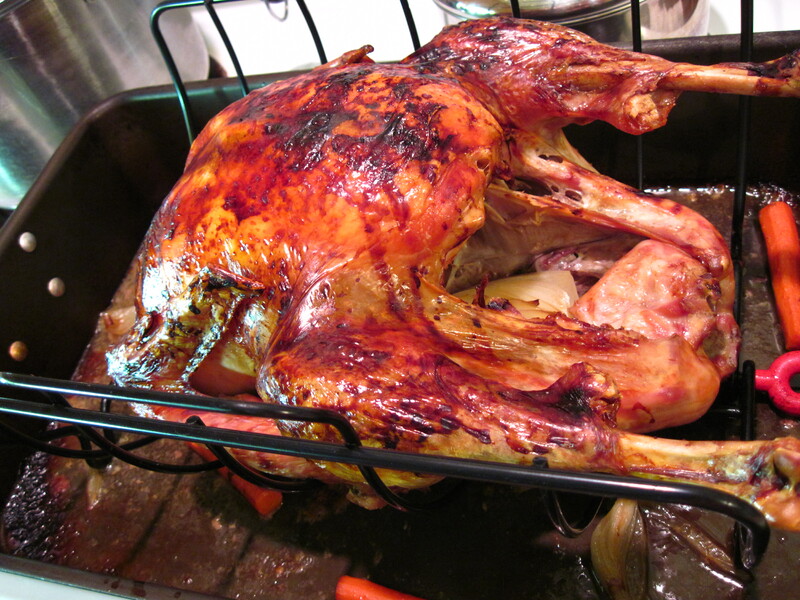 Brush the turkey with the glaze and roast for about 1½ hours longer, basting occasionally. Add a bit more water to the pan if it’s starting to evaporate too much. You want to maintain about 2 ½ – 3 cups water in the roasting pan. The turkey is done when an instant read thermometer shows at least 165˚ when it’s inserted in the thickest part of the breast. 10. When the turkey is done, put the turkey on a platter and loosely cover with heavy-duty foil. Let it rest for about 30 minutes. 11. Let the broth in the roasting pan rest for about 5 minutes. Then skim off as much fat as you can. Reserve the fat to use for gravy, if desired. Strain the broth and combine it with the broth in the sauce pan. 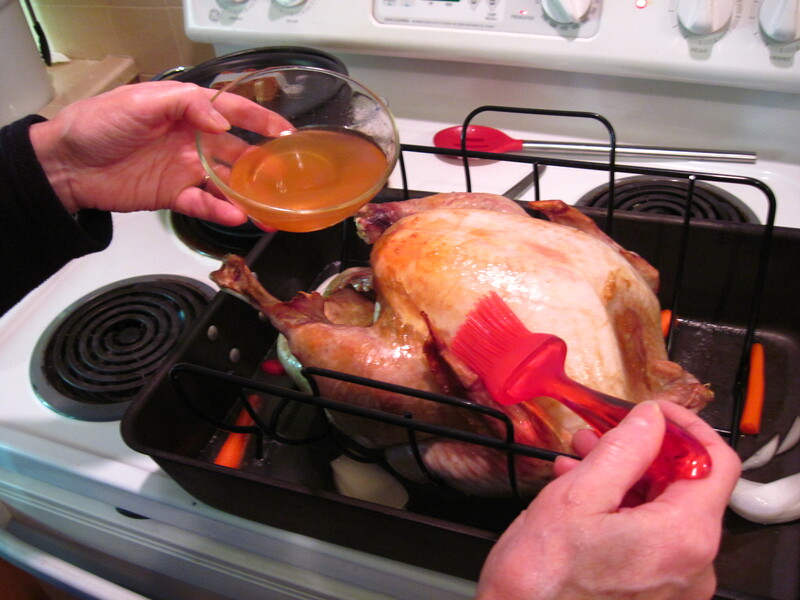 Use 4 cups of the broth to make gravy while the turkey rests. Any extra broth can be frozen. Makes about 2½ cups, serving 8. If you don’t have enough turkey broth, use what you have and add chicken broth to make 4 cups. 1. Melt the butter in the turkey fat over medium heat in a large skillet. 2. When the butter is melted, add the flour to make the roux. Cook, stirring constantly, for a few minutes. The roux will turn brown. 3. Remove the pan from the heat. Pour some of the broth in the pan and whisk vigorously until it is smooth and lump-free. 4. Whisk in the rest of the broth. Whisk in the optional fish sauce if using. 5. Put the pan back on the burner; reduce the heat so it is just simmering. Cook, stirring occasionally, for about 10 minutes. 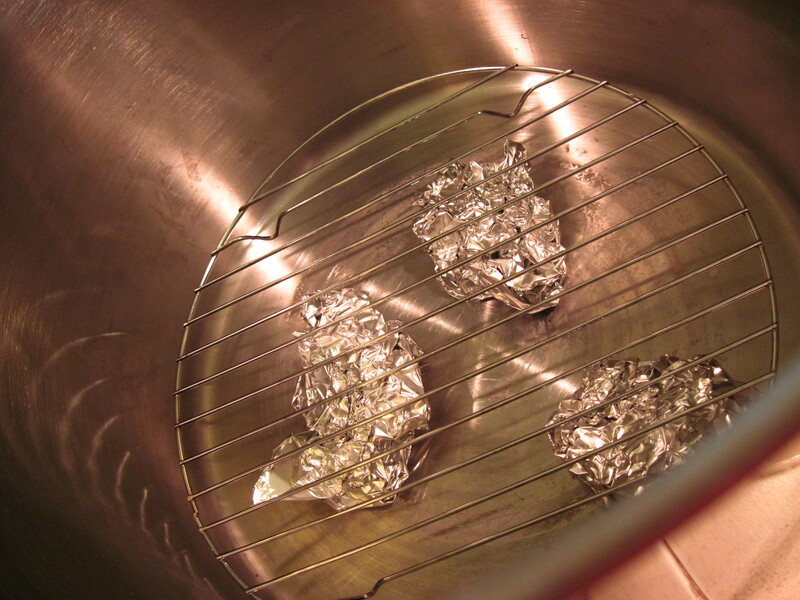 You can use way fewer dishes by only using a roasting pan, and cover that with foil (several pieces folded over twice length-wise 1/4 inch and tucked under the rim tightly) for the steaming part, remove the foil cover, reserve the stock in a separate container and proceed with the roasting steps. One less huge pot to clean!